This concise text, first published in 2003, is for a one-semester course for upper-level undergraduates and beginning graduate students in engineering, science, and mathematics, and can also serve as a quick reference for professionals. The major topics in ordinary differential equations, initial value problems, boundary value problems, and delay differential equations, are usually taught in three separate semester-long courses. This single book provides a sound treatment of all three in fewer than 300 pages. Each chapter begins with a discussion of the 'facts of life' for the problem, mainly by means of examples. Numerical methods for the problem are then developed, but only those methods most widely used. The treatment of each method is brief and technical issues are minimized, but all the issues important in practice and for understanding the codes are discussed. The last part of each chapter is a tutorial that shows how to solve problems by means of small, but realistic, examples. 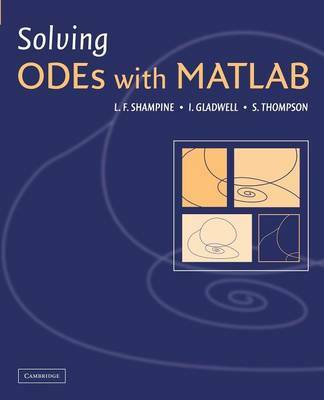 "...a very useful book to those who are looking to expand their MATLAB experience." Amanda Bligh, Product Design Engineer, Hasbor, Inc.